Free shipping to United States with $20 purchase from ShutUpAndCuffMe. See item details below for sale terms. 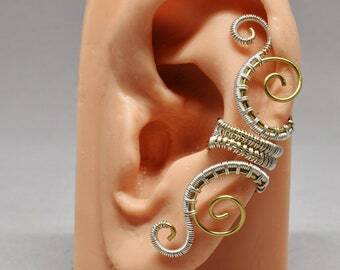 Spirals trail along the edge of the ear on a cute swirly ear cuff. Now available in Sterling Silver. 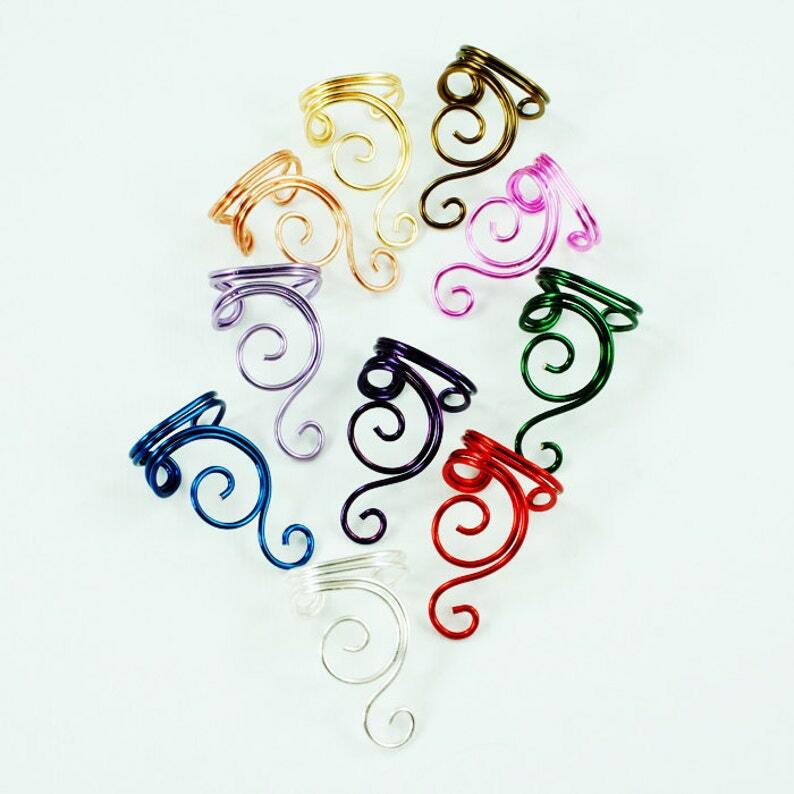 If ordering more than one ear cuff and you want them to be different colors or for different ears, you MUST put them into your cart individually, properly indicating which color and ear preference for each one. Focal for this cuff is approximately 7/8" (21mm) long. No ear piercing is required to wear this ear cuff. This listing is for only ONE ear cuff. 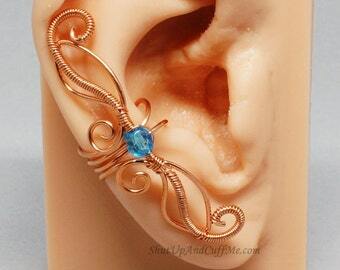 Wire used is colored enameled copper (except for the natural copper and sterling silver). This ear cuff will be made to order. Because of the nature of handmade items, the one you will receive may not be an exact duplicate of the one shown, however it will be as close as possible. 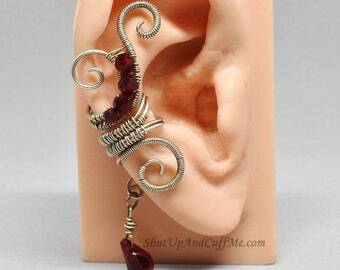 All ear cuffs are made to fit an average size ADULT ear. Special offer details: Discount applies to item cost only. Cannot be applied to shipping costs. Free shipping details: All US orders of $20 or more ship for free! Minimum order amount applies to item total only. Shipping charges cannot be applied to the minimum order amount. Super cute ~ 2nd gift bought from this shop for my daughter ~ Thanks again !! Looks just like picture and came quickly. Payment is due at time of purchase. No items will ship before payment has been made and cleared. If you have paid for your purchase using an e-check, your items will ship after the e-check has cleared. For information on paying using an e-check, please see the paypal web-site. There will be a 7.5% sales tax fee added to the total cost of your order. Etsy may collect sales taxes for other states, depending on the laws in the state your order is being sent to. I will only accept returns of merchandise if an item is found to be defective. If it is an item I can re-create I will do so and send the new one. If it is not an item I can re-create I will offer another item from my shop (equal or lesser value) in exchange. If there is no other item comparable in my shop at that time, I will issue a refund. The item in question must be returned to me (customer pays return shipping) before I will issue a refund or send a replacement item. If the item is indeed found to be defective, the cost of return shipping will also be refunded. No refund is given for items that are not defective. You will have up to 7 days after the the delivery date as shown in the tracking info provided by USPS, (14 days for international orders) to return an item. You must contact me (you can use the contact link at the right hand side of this page) before returning merchandise. the item to the customer AS IS. All orders will ship only to the address provided to etsy during checkout. All orders of $30 or more sent to US destinations will ship for free. All other orders are shipped for the fee listed in the item page. All items are shipped USPS First Class, unless otherwise specified in the item listing. If you order more than one item at one time a you will pay the full shipping rate for one item and a discounted rate for the rest. If you would like shipping upgraded to Priority Mail, please contact me for a revised shipping quote. Domestic (U.S.) packages with a total value of $150 or more will be insured for free. If your order is for less than $150, and you would like your package shipped with insurance, please contact me by using the contact link at the right hand side of this page. I will send you a revised invoice with the cost of postal insurance added to your order total. In most cases, orders placed before 5pm ET will ship the following business day. For items that are returned to me by the USPS, if the reason for the return is due to an error that I made in addressing the package, I will either re-ship the item (at no extra charge) or give a full refund, according to the customer's wishes. For items that are returned to me by the USPS, if the reason for the return in due to customer error in the address supplied during checkout, or other reason's beyond my control, I will refund the purchase cost, minus the cost to ship the item. I am happy to do custom orders. Contact me using the contact link at the left hand side of the page if you are interested in a custom order. Please give as detailed of a description as possible of exactly what you are looking for. However, please do not send me a photo of another artist's work and ask me to copy it as all such requests will be denied. Once I understand what you need, I will quote you a price based on the labor involved in making the piece and the materials. The item must be paid for in full before I will begin working on your order. Once a reserved listing for a custom order is created, it must be purchased within 2 weeks of the listing date. If the listing is not purchased during that time, the custom order will be cancelled. If, for some reason, work was done on a custom order before payment was complete, and payment is not made within 2 weeks of the listing date, the custom order will be cancelled and the item made will be listed and made available to all customers. Coupon codes cannot be applied to custom orders. If a coupon code is applied during checkout for a custom order, the item will not be sent until the remaining cost of the item is paid in full. Custom orders and items listed in shop as made to order may take up to two weeks to ship after payment is made. These items are made in the order that the purchases were made. In some cases I will hold items if requested by a customer. Once an item is placed on reserve, it must be purchased within 7 days. If purchase is not made within 7 days, the item will be taken off of reserve and made available to all customers.